Andrew Boone is a senior theatre major at ACU and has worked in Special Collections for three years. Today we honor the life of Abilene Christian University’s 9th President, William J. Teague with this blog post below from Andrew. Tom Teague told me he didn’t want me to refer to this as a funeral. “If there’s anything about this that resembles a funeral, we’ve failed,” he told me. Instead, he wanted the December 6 event to be a celebration of the life of his father, William J. Teague. 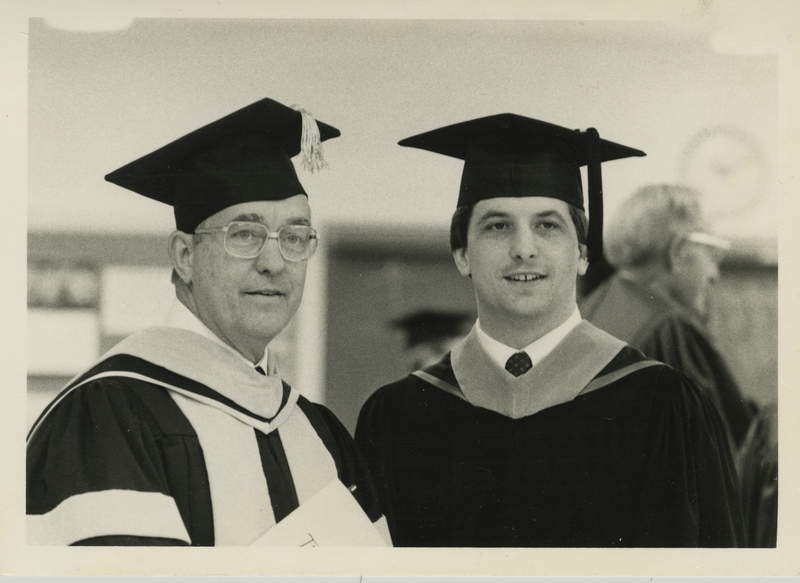 William J. Teague, left, next to his son Tom, right, at Tom Teague’s graduation. Sewell Photograph Collection, Milliken Special Collections, Brown Library. Abilene Christian University, Abilene, TX. William (known as “Bill”) Teague served as the ninth president of Abilene Christian University from 1981 until 1991. An alumnus of Abilene Christian College with a degree in Bible and Speech, Teague believed strongly in the value of education, not only as a means of intellectual growth and professional preparation, but as a tool for personal and spiritual growth and connection. 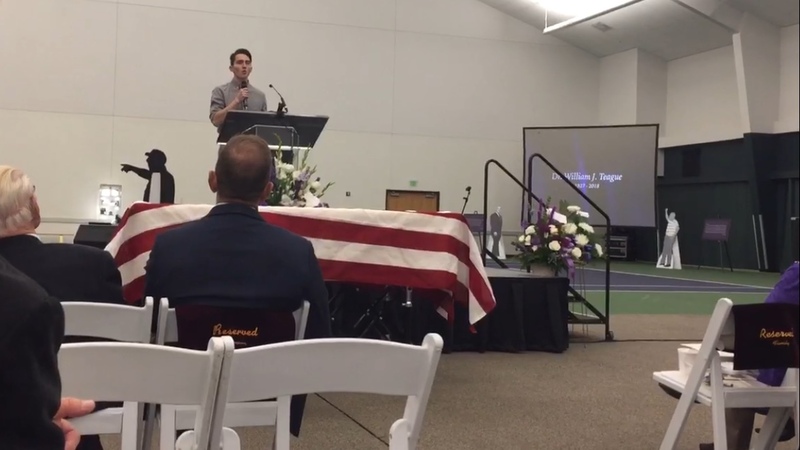 The service was held, fittingly, in the Teague Special Events Center, on the indoor tennis courts that had been covered with carpet for the ceremony. Tom Teague achieved his stated goal; the memorial did not have the air of a funeral. Guests were jovial, talkative, and smiling, sharing stories about Teague’s life and food catered from Perini’s. The ceremony was concise and ripe with humor, just like Teague’s mode of verbal communication. Dr. Gary McCaleb gave the invocation and read scripture. 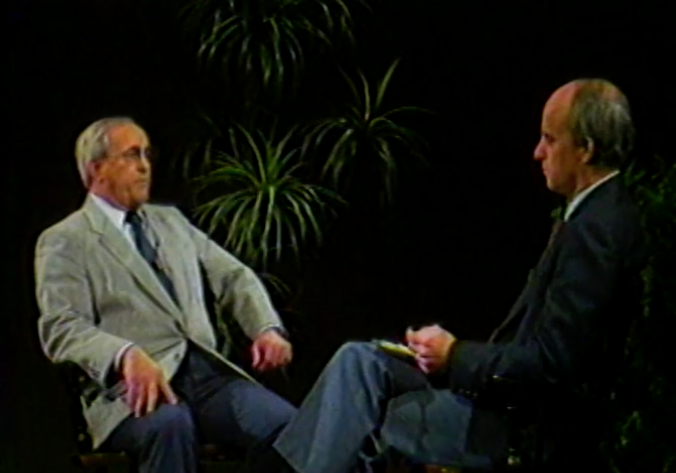 Footage of Dr. Gary McCaleb interviewing then President Teague. Abilene Christian University and McCaleb, Gary, “On Campus Video, Featuring William J. Teague” (1986). McCaleb & Company. This song provided a segue into a speech by Tom Teague, which centered around the theme of being “not ashamed.” Tom spoke of his father as being unashamed of his faith, his family, his values, his school, and his passions. I never knew Bill Teague, but the many stories that his son shared–some very old and others quite recent–gave me the feeling that I did. To say it was an honor to participate in the memorial service for such a beloved and important figure in ACU’s history would be greatly understating the point. As a student archives assistant in the ACU Special Collections, I spend all day handling, digitizing, describing, and sorting materials related to ACU/ACC history. Today, I had the privilege to be a part of it. Andrew Boone sings at December 6 service for Dr. William J. Teague.